(May 2006) Website Financial - Web Hosting service annual fee: The response to our appeal for 12 classmates to donate $10 to pay the annual fee to the Web Hosting service was amazing. So many offers of help reduced our request to $5. Well, the last payment (we think) has arrived. And guess what? There were enough funds to pay for the first year AND the second year. Thank you all so much for your support! (June 2006) Proud parents Mike and Kathleen Johnson have just seen their daughter, Susan, graduate (with many honors) from high school. Susan excels in music, playing the viola, piano, and organ. This Fall, she enrolls at St. Olaf's College in Minnesota. (June 2006) Everyone, for whom we have an E-mail address, has been notified of the 50th Reunion photos on this website. This was a major effort. (June 2006) A note from Aline de Boton Kultgen: "Your e-mail jogged my memory and I want to take this opportunity to thank you and all of the other hard workers, photographers, techs, etc. who produced the DVD and pictures. I feel privileged to have received the DVD's even though I did not attend the festivities. I did have a good time looking through the pictures of everyone, some of whom were completely recognizable and others... not. I am now retired, as of May 31, and fully intend to attend the next reunion. Thanks again! Aline (de Boton) Kultgen)"
(June 2006) A note from Kathi Gilbreath Thanos re: Reunion Photos: ".... It was really fun to see all my classmates and trying to figure out who was who. Some look exactly the same [Maren] and others had changed. You all looked like the parties were thoroughly enjoyed and reaquainting was the best. Nancy Heberling and I have gotten together and will again after we all return to AZ. It is so rewarding to have old friends. Thanks again. If we couldn't be there then this was amazingly close. Hello to all. Kathi Gilbreath Thanos"
(June 2006) Classmates Mike Johnson, Diana Umland Bos, and Grey Whipple met in early June to discuss plans for another class gathering up in Oregon in Fall 2007. More news will be forthcoming soon! Click on the image of Diana with 'Daisy', a restored Model A Ford, an earlier gift to her late husband, Jim. (July 2006) At the suggestion of classmate Mike Langston, we did a web search on Nancy Hirshberg. What we found was most interesting and it has been added to Nancy's Senior Photo page. (July 2006) A note from Gretchen (Gautsch) Gottschalk who summers away the heat in the coolness of the White Mountains in Arizona. She and husband Fred live in Houston where he is an adjunct professor at Sam Houston State University. Alas, we have not seen Gretchen for six years. (July 2006) Another Internet link has surfaced opening another window into the life of classmate Richard Keehn. It is a posting titled "Night Hunter Operations" by Captain Richard C. Keehn, U.S. Army Aviation Digest – May 1969. It describes an operational concept directed against enemy forces and logistical traffic in the Mekong Delta during the Viet Nam War. It is quite long and one needs to be a military history buff to appreciate the detail. This was done under the auspices of A Troop, 3rd Squadron, 17th Cavalry, in support of the 1st Brigade, 9th Infantry Division, U. S. Army. (August 2006) IN SYMPATHY. Anna B. Alexander(92), mother of classmate Carol Alexander. Several of you knew Anna and her life story can be found on Carol's Senior Picture page. It makes for very interesting reading. Incidentally, Carol has a new E-mail address. Contact Grey to get it. (September 2006) IN MEMORIAM. Vivian Irene Wik Nicolet (1937 - 2006). See her life story on her Senior Photo page. (September 2006) IN MEMORIAM. Marlene Givens Scally ( 1938 - 2006). See her story, too, on her Senior Photo page. (September 2006) The life story of classmate Dr. Peter Brill, MD can now be read on his Senior Photo page. (September 2006) Happy News! Classmate Barbara Baumeister Super and Bob Student were married September 23, 2006 in San Franciso. Barbara and Bob were guests at our 50th Reunion last October. Visit Barbara's Senior Photo page for a photo from the wedding invitation. (October 2006) Classmate Nan-Susan Gruman Brown has moved from Burlingame to Sunnyvale CA. Contact Grey for new address and phone numbers. (October 2006) E-mails and snail-mails are being sent to our classlist announcing the SUNRIVER RETREAT next October. Visit the Sunriver page on this website. (October 2006) New photos of Vic Mangini (Dean of Boys) and Bill Walsh (math and science teacher) are posted on the Faculty and Staff page of this website. Vic's bio has been supplemented. 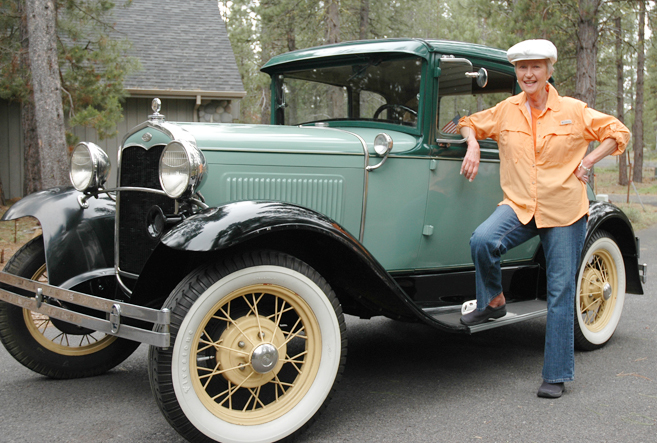 Here are two nonagenarians that just keep on truckin'. (October 2006) Dateline: Sunriver, October 22, 2006.Classmate Diana (Umland) Bos of Sunriver OR is joyously announcing her plans to marry Lloyd Swenson, also of Sunriver, next Spring. Lloyd is a retired mechanical engineer from IBM in San Jose and has been a flight instructor for over 35 years. They will continue to live in Sunriver. She is eager to have those coming to the Retreat in October meet him and share in this new chapter of her life. 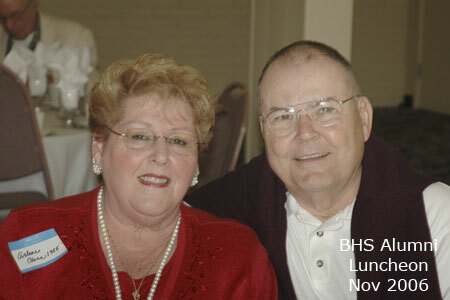 (November 2006) Representing the Class of 1955 at the BHS Alumni Association's annual Alumni/Faculty Luncheon were Arlene (Borelli) Hipsher and Grey Whipple (click on photo to view full-size). Arlene has been a Board member of the Association for a number of years. This year's luncheon was not particularly well attended, and there were no alumni younger than Class of 1969. There was one interesting quirk: it did not happen by design, but all the Washington School grads at the luncheon sat at the same table, 8 out of 9. Seated with Arelene and Grey from the BHS Class of 1958 were Jo-Ellen (Arnaudo) Ellis and Peter Cleaveland. Jo-Ellen is the membership secretary for the Association, and Peter, a retired TV broadcaster, was master of ceremonies. A Burlingame police officer (BHS'77) was the program speaker. He is funded by the City of Burlingame to work full-time at BHS keeping a lid on things, so to speak. Other dignitaries present were Vic Mangini (who else!) and Gerald Arrigoni, the last school Principal before the current Principal, Matt Biggar. (November 2006) BHS Athletic Hall of Fame and 79th Annual Little Big Game. 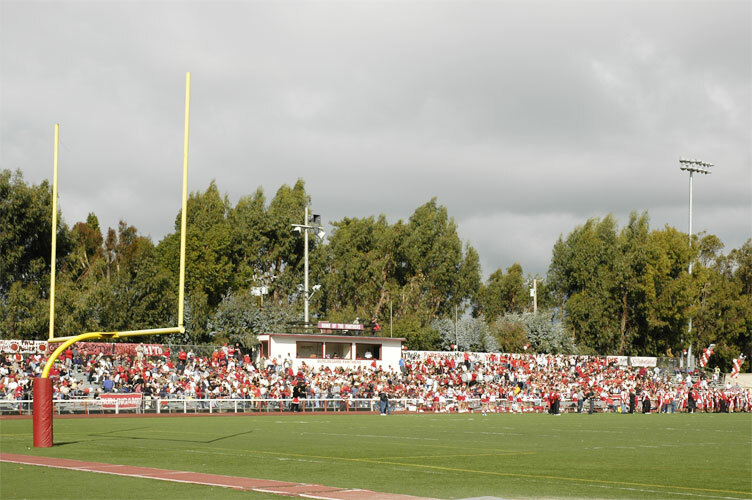 The Burlingame High School Athletic Hall of Fame was originally supported by the BHS Boosters Club (or something like that). But it has come to pass that the Burlingame Alumni Alumni Association is now in charge. Certainly, over the years BHS has produced its share of athletic excellence, but now, 51 years later, the Classs of 1955 is finally recognized. Congratulations to Ted Treu and Jess Undlin. Their athletic biographies and photos are now posted on their senior photo page. The induction ceremony was actually a lot of fun. A visiting dignitary was Vic Mangini, Jess's track coach. Of interest is Ted's brother, John Treu'52, who was also one of the inductees.The price of admission included coffee and bagels and a ticket to the Little Big Game. Showing support from the Class of 1955 were Arlene (Borelli) Hipsher, John Basye, Grey Whipple, and Joyce (McConkey) Williams.